Best Portrayed in Mission Impossible – Ghost Protocol (Dubai), Fast & Furious 7(Abu Dhabi). 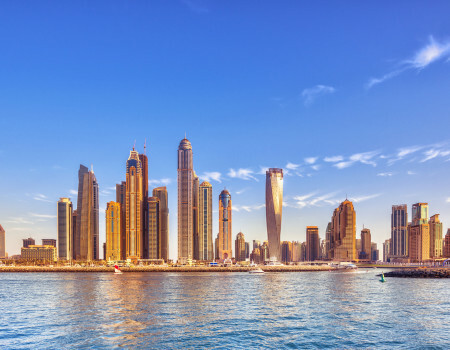 Dubai has experienced rapid growth like no other city, transforming from a small pearl fishing settlement on the edge of the desert to a glittering metropolis of high rise structures within 50 years. 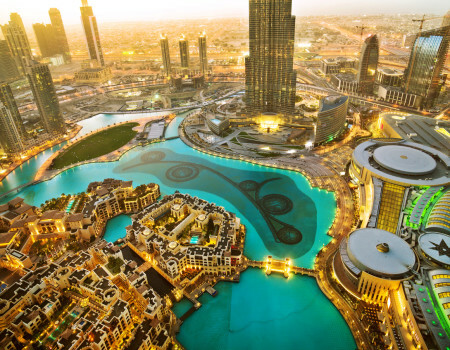 Now, the emirate is maturing, its impressive architecture and plethora of modern-day attractions matched by a nascent cultural and arts scene and recognition of its historical roots. With Dubai hosting the World Expo in 2020, the emirate has entered another growth spurt and visitor numbers are on the rise. Whether you’re looking for a relaxing beach holiday or an adventurous escape, it may be wise to claim a sun lounger now on one of those pristine, golden-sand beaches, or book your skydive over the dazzling coastline before the place is overrun. For visual impact, it’s hard to go past the uber-chic Armani Hotel Dubai, which occupies 11 of the 160-plus floors of the 828-metre Burj Khalifa, the world’s tallest tower. The views of Downtown Dubai from the Armani are all manmade, a testament to Dubai’s “build it and they will come” philosophy. Alternatively, live the high life at the Bulgari Resort Dubai, which opened in December 2017, and was almost immediately crowned the best new luxury hotel—not just in the UAE, but in the world—in Luxury Travel Intelligence's annual list. It’s situated on Jumeirah Bay, an island shaped like a seahorse that links to central Dubai via a 300-meter bridge. The glitterati stay in the standalone villas with private pools, parking and a dedicated butler service. By Dubai Standards, One&Only The Palm feels like a boutique hotel. Situated at the furthest point of one of the outer fronds of man-made Palm island in Jumeirah, it’s the antithesis of the hustle and bustle of downtown Dubai; an oasis of beachside calm. Al Maha is an oasis of a different kind, offering a contrasting perspective of the emirate. The resort is a 45-minute drive from central Dubai, nestled in a palm oasis in the heart of the Dubai Desert Conservation Reserve. All suites have a private chilled pool and deck, with views of the Arabian Desert and wildlife viewings are common. Back in “new Dubai”, the first hotel built in Dubai Marina, Grosvenor House offers superb night views of the marina and The Palm, along with easy access to the restaurants and bars encircling the water. Dubai Marina itself is an interesting melting pot of cultures, with visitors and residents mingling and dining by the manmade marina. 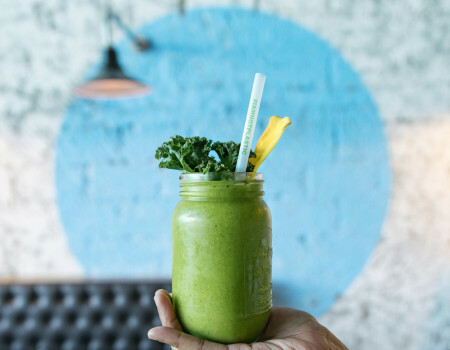 Giselle Whiteaker is the editor of a portfolio of lifestyle and property publications in the UK, and writes regularly on travel and food. She was previously Group Deputy Editor for Etihad Airways' suite of inflight magazines and has contributed to publications including The Ritz, Luxury Briefing, St George and Ad Astra's Lifestyle. She is Australian and has lived in Japan, South Korea, the United Arab Emirates and Vietnam, now calling London home. Her travel goal is to visit every US state—she has two remaining. Dubai has a phenomenal international dining scene, with all manner of celebrity chefs represented, and some superb cuisine on offer. For romance, Pierchic, perched on the end of a pier jutting into the Arabian Gulf is picture perfect. The three-course sunset dinner is the way to go, but book early to secure a deck table with Burj Al Arab views. For those with loftier ambitions, At.mosphere, on the 122nd floor of Burj Khalifa has the At.mosphere Signature Experience, a seven-course degustation menu that literally takes Dubai’s dining scene to new heights. At ground level, Tom & Serg, an industrial style café, is near the arts district, or if you’re looking for Michelin stars, try Galvin Dubai from Michelin-starred brothers Chris and Jeff Galvin, known for their acclaimed restaurant in London’s Harrods department store. 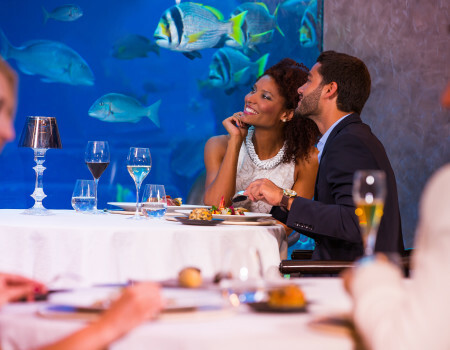 There’s also the three-starred Ossiano, inside Atlantis The Palm, with its mammoth aquarium containing 65,000-odd marine dwellers. Unusually, local food is a little harder to find, although there are plenty of mid- to high-end eateries dishing up regional Arabian cuisine. For authentic Emirati dishes, Al Fanar Restaurant and Café in Dubai Festival City emulates a traditional Pearl Merchant’s house from the 1960s and serves meat and grain-based dishes flavoured with turmeric, cardamom, saffron and thyme. Dubai is not short of watering holes either. 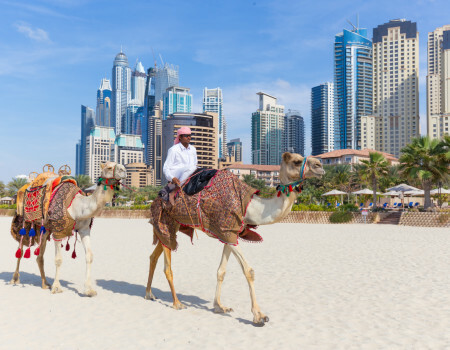 For the ideal sundowners’ spot, catch a golf buggy at Jumeirah Beach Hotel to 360°, an open-air bar where you can sink into a sofa, sip a drink and sample shisha to a backing track of chill-out tunes. An aerial view gives a full understanding of the extent of this desert metropolis—Seawings seaplane flights depart from the waters of the Arabian Gulf beside the Jebel Ali Beach Hotel or Dubai Creek Golf & Yacht Club and soar past architectural marvels and man-made archipelagos, with views stretching for miles. 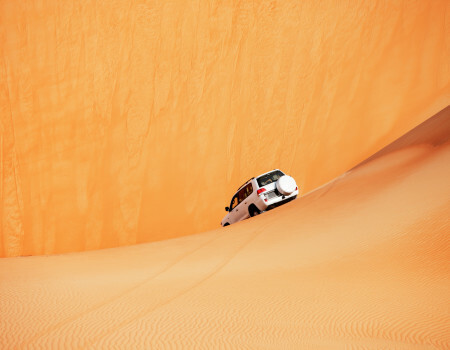 Contrasting with this coastal perspective, a desert safari is a must. Platinum Heritage is the cream of the crop, with the Heritage Desert Safari using vintage Land Rovers to transport guests to a Bedouin camp inside a private Royal retreat in the desert for cultural activities and dinner under the stars. Once you’ve marveled at the empty expanse of dunes and desert, cool off at Ski Dubai, the indoor ski slope and snow park inside Mall of the Emirates. You can see in through viewing windows from the mall, but it’s worth kitting up and experiencing the sub-zero temperatures. More cultured pursuits include Alserkal Avenue, the hub for Dubai’s burgeoning contemporary art scene, which houses more than 60 art, design and creative venues spread across 500,000 square feet, including not-for-profit artists’ studios, project spaces, concept stores and unique food and beverage outlets. Away from the glitz and glamour, Bastakiya is a reminder of Dubai’s historical beginnings. This old residential area established in the 1890s is composed of a maze of alleyways lined with traditional Gulf houses, capped with wind towers. It’s home to Al Fahidi Fort, Dubai Museum, the charming Arabian Tea House, and galleries, including XVA and the Majilis Gallery. Further along Dubai Creek, abra ferries zip across to the souqs (markets) in Deira, a million miles away from the air-conditioned upscale shopping malls. Abu Dhabi, the capital of the United Arab Emirates, is less than an hour and a half’s drive from Dubai, yet it has a completely different feel. 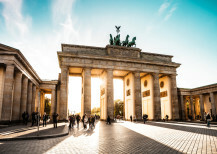 It still has its fair share of skyscrapers and grandeur, but has developed in a more measured way, with a more relaxed pace. 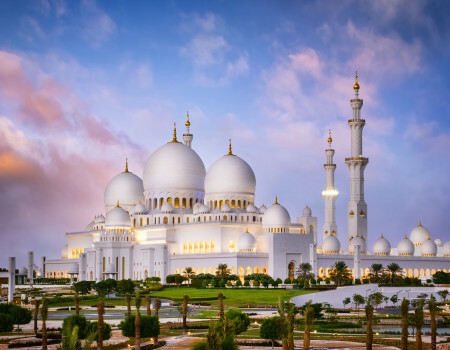 Sheikh Zayed Grand Mosque is perhaps representative of Abu Dhabi’s quiet, yet grand ambitions, worth visiting for the architecture alone, with 22 domes and more than 1,000 columns adorning the structure. Inside the mosque, there are mosaics, enormous crystal chandeliers, intricate glasswork and the world’s largest hand-knotted carpet, crafted by 1,200 artisans. 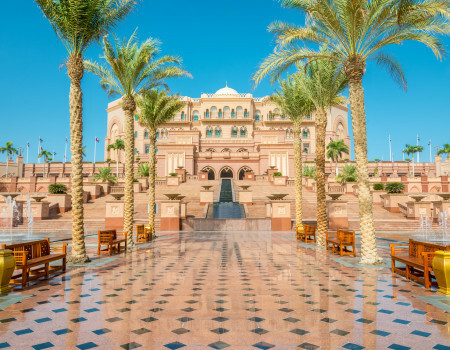 Almost equal in scale, with an astounding 114 domes, Emirates Palace Hotel—Abu Dhabi features opulent gold marble interiors and numerous pieces of ancient sculpture displayed by the Barakat Collection, in the hotel’s central hall. For art aficionados, however, the recently opened Louvre Abu Dhabi on Saadiyat Island, Abu Dhabi’s entertainment district, is a major draw card. With a footprint of approximately 260,000 square feet, 86,000 square feet of which is galleries, it is the largest art museum in the Arabian peninsula and the first museum to be conceived in a diplomatic agreement. The Louvre Abu Dhabi is home to some 600 works, half of which are loans from 13 leading French museums. The works span not just periods of time, but continents, styles and themes. For Emirati fine dining, try Mezlai, inside Emirates Palace. 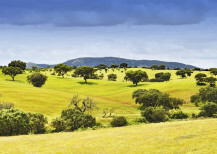 The ingredients are local and organic, using traditional cooking techniques. The Lamb Medfoun—lamb wrapped in banana leaves and slow-cooked—is the highlight. For international fare, book into COYA Abu Dhabi, a contemporary Peruvian restaurant on Al Maryah Island with colorful décor and water views or the intriguing Asia de Cuba at St Regis Hotel’s Nation Riviera Beach Club on the Corniche. The Chino-Latino menu is intriguing, representing what Asian-influenced Cuban food could have become if Cuban chefs had evolved the cuisine with the global ingredients available to the rest of the world.